Cannon County senior guard Emily Sissom puts up a shot against Smith County Friday. (TONY STINNETT photo). Friday was officially "Senior Night" for four CCHS Lionettes as the team concluded the regular season home slate against Smith County. The Lionettes secured a resounding 74-42 win against the Lady Owls but veteran players say the final curtain has not closed on Cannon County playing on its home court. "I really tried not to think of this as 'Senior Night' because I do not believe it is our last game on this court," senior forward Chelsey Payne said. "I really believe our team will be back on this court playing again this season, so tonight was about taking care of business, gaining momentum and honoring our seniors, but our fans need to know it is not our last game in this building." If the No. 10-ranked Lionettes (22-6) continue playing like they have of late, Payne may be on to something. Cannon County concluded the regular season at York Saturday and will begin the District 8-AA Tournament against DeKalb County Thursday, but a strong run in the district could land the Lionettes a first-round region home game. A home sectional game also remains a possibility. If it was Cannon County's last home game, then seniors Taylor King, Payne, Lauren Ruehlen and Emily Sissom gave the standing-room only crowd something to remember them by. The quartet has turned in four straight 20-win seasons, but their play down the stretch offers promise for more games on the horizon. "I'm proud of our four seniors," Lionettes Head Coach Michael Dodgen said. "They are four well-rounded individuals who represent this high school, program and their community. They are great girls from great families. They came into the program when times were not good and they got the program to the status it is now. They have worked so hard to do all the things asked of them and it has not always been easy, but they did it. These girls represent what is great about high school athletics so I'm proud of them and what they stand for." Cannon County received strong contributions from its inside game against Smith County as Payne erupted for 18 points on 7-of-10 shooting to go with six rebounds and four steals. Lauren Ruehlen finished with 14 points and Taylor King added 12 points, six rebounds, six steals and eight deflections. Abbey Sissom finished with seven points and Emily Sissom added six, while Lindsey Reed continued to show she's back to form with 10 steals, six assists and 10 deflections. 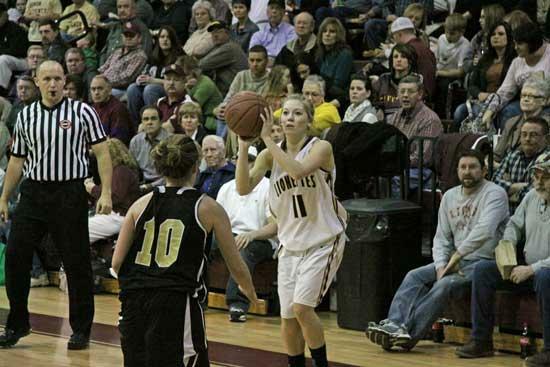 Her defensive genious helped lead to numerous fast break baskets for the Lionettes. "We've talked a lot about what I envisioned this team being at the start of the season but we had some injuries that kept (Reed and Ruehlen) out of the lineup for most of the season," Dodgen said. "You are starting to see it now. We are getting healthy and getting everyone on the same page. Sometimes it takes awhile to get chemistry but we are getting there at the right time." Cannon County owned a 20-19 lead midway through the second quarter but used a 18-2 run to close the half and led 38-22 at intermisson. The Lionettes continued to build their lead in the second half as they pulled away for the easy win.